Innovation. Transformation. Quality. Service. Value. They're among the words likely to be sprinkled into just about any conversation about the current state of healthcare. But read about the men and women inducted into the Health Care Hall of Fame over the past three decades and you'll learn that these trailblazers have been walking that talk for generations. That's what the Hall of Fame is all about: lasting legacy. The current American healthcare system reflects the collective and cumulative works of countless men and women from all backgrounds, sectors and professions. The brief biographies on the following pages represent just a few of the more than 100 game-changers inducted into the hall since 1988. The fruits of their work, and in many cases their names, are still prominently on display throughout the industry. Readers can learn more about each of the inductees by viewing the virtual Hall of Fame gallery at ModernHealthcare.com/HOFGallery. The actual Hall of Fame is housed at Pennsylvania Hospital in Philadelphia, considered to be America's first hospital. It's a true shrine to lasting legacy in U.S. healthcare. In the late 1800s, southeastern Minnesota wasn't exactly a booming metropolis. And it certainly wasn't what sprang to mind when people thought “medical innovation.” But today, people from all over the world are drawn to Rochester, Minn., by one simple word: Mayo. And it all started with two brothers—Drs. Charles and William Mayo—and their physician father, William Worrall Mayo. The origins of the Mayo Clinic can be traced to a deadly tornado that struck Rochester in the late 1800s, destroying much of the town. The Mayo brothers and their father tended to the injured. Following the tragedy, the community recognized the need for a hospital, which opened in 1889 with the Mayos operating part of the facility. The hospital became the Mayo Clinic in 1915. 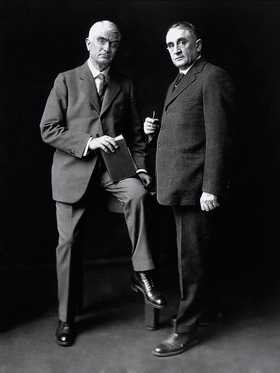 The legacy of the Mayo brothers, William, left, and Charles, is still celebrated annually at the clinic in Rochester, Minn.
What drove the clinic's growth in size, influence and reputation was the Mayo brothers' dedication to “putting the patient first.” They were far ahead of their time in using coordinated care through pioneering efforts in multispecialty practice and promoting teamwork between caregivers and administrators. Meanwhile, one of the Mayos' early hires, Dr. Henry Plummer, also a member of the Hall of Fame, advanced the quality of care through numerous clinical and technological innovations. The tenets of the Mayo brothers endure. The system today has major campuses in Florida and Arizona in addition to the flagship operations in Rochester, as well as affiliations across the country. “The north star that we always have at Mayo Clinic is asking what's best for the patient,” said Matt Dacy, a museum director and chair of the heritage program at Mayo. “It's a simple phrase but is actually very profound because it guides us in virtually everything that we do, whether it's how we deploy resources, how we engage the staff and how we set priorities.” He also pointed to the strong sense of collegiality that the brothers imbued. Dacy also notes that Mayo continues to hold annual Heritage Days events, during which staff and physicians spend a week talking about particular aspects of the brothers' continuing legacy. The Mayo brothers, both inducted into the Hall of Fame in 2009, died within months of each other in 1939. Another familiar health system was also formed by a family of physicians, but this time it was a father and son. Fifty years ago, Thomas Frist Sr. and Thomas Frist Jr., along with businessman Jack Massey, formed Hospital Corporation of America in Nashville. HCA at its inception was just one hospital and a nursing home. It filed its first initial public offering a year later, establishing the Frists as trail-blazers in for-profit healthcare. The system grew rapidly, and at one time it owned or managed more than 500 hospitals. Its history includes several trips to private ownership and back to publicly traded status, as well as an ill-fated merger in 1994 that created Columbia/HCA Healthcare Corp. That deal would unravel several years later following federal investigations into the company's billing practices. Through subsequent acquisitions, divestitures and restructurings, the company has continued to dominate the sector and remains the largest investor-owned chain. Frist Sr. was inducted into the Hall in 1990 and passed away in 1998. His son was inducted in 2003. Sister Mary Jean Ryan, the retired longtime CEO of SSM Health and one of this year's inductees into the Health Care Hall of Fame, follows in the footsteps of many pioneering religious sisters. Eight other nuns have entered the hall over the years, taking diverse paths and representing many generations. Among them are two saints, Frances Xavier Cabrini and Elizabeth Ann Seton. Mother Cabrini, the first U.S. citizen to be canonized, founded the Missionary Sisters of the Sacred Heart of Jesus. Among the order's many accomplishments and good works over the decades was the founding of numerous schools, orphanages and hospitals. She passed away in 1917. Mother Seton, the first American-born saint, founded the Sisters of Charity in the U.S., which also has a long legacy of serving the most vulnerable and establishing hospitals, schools, orphanages and nurseries. She died in 1821. Sister Ignatia Gavin is best known for her close work with Dr. Bob Smith, a co-founder of Alcoholics Anonymous. Known as the “Angel of Alcoholics Anonymous,” Sister Gavin was a pioneer in treating alcoholism before it was even recognized as a legitimate medical diagnosis. During a time when most hospitals turned away “drunks,” Sister Ignatia, working with “Dr. Bob” at St. Thomas Hospital in Akron, Ohio, went out of her way to treat them with kindness and respect and help them up sober up. She is credited with helping to develop some tenets of the AA program. She passed away in 1966. The sisters also weren't strangers to health system C-suites. Among them, Sister Mary Roch Rocklage was the founding CEO of Mercy Health System based in Chesterfield, Mo., serving from 1986 to 1999. The system continues to thrive although its sponsorship has changed, and Sister Mary Roch is still active in an advisory role. Sister Irene Kraus in the late 1980s became the founding CEO of the Daughters of Charity National Health System, once among the nation's largest not-for-profit hospital systems. In 1980, she became the first woman to chair the American Hospital Association. Sister Irene passed away in 1998. The organization known today as Kaiser Permanente, and its successes with prepaid healthcare, first took root in California's Mojave Desert. It was in the early 1930s and thousands of laborers were building the massive Colorado River Aqueduct project. A young physician named Sidney Garfield saw a golden opportunity in providing care for the men to keep them in good health and able to work. He even built a 12-bed hospital. But getting paid by insurance companies proved difficult, and many workers didn't even have coverage. An inventive insurance agent named Harold Hatch came up with idea of getting insurers to make an upfront payment for each worker to compensate Garfield for his services, giving birth to the concept of prepayment for industrial care. 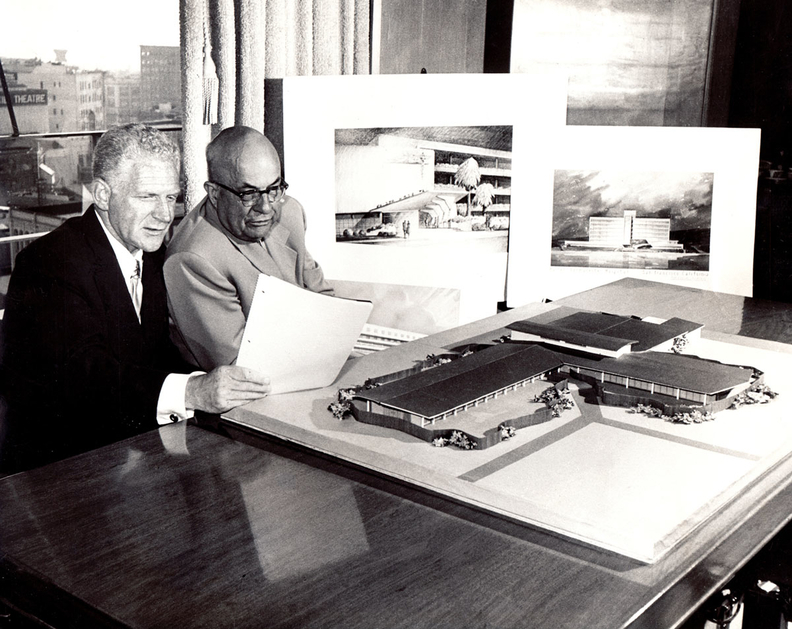 Dr. Sidney Garfield, left, and Henry J. Kaiser review some models for hospital construction in the early 1950s. Garfield started his prepaid care model with one 12-bed hospital in the 1930s. Today, the Kaiser system has 39 hospitals. Garfield later moved his practice to Los Angeles after the aqueduct work started to wind down. It was during this time that he got a call from a man named Henry J. Kaiser, who had diverse industrial enterprises. Kaiser wanted to learn more about prepaid healthcare and how it could be applied to his nearly 7,000 workers erecting the Grand Coulee Dam in Washington. Early in World War II, Kaiser again turned to Garfield to help set up hospitals and recruit doctors to deliver care for tens of thousands of shipyard workers building America's fleet of warships. The integrated delivery system flourished in the proceeding years. Today, Kaiser Permanente has 39 hospitals and more than 22,000 physicians serving nearly 12 million members in nine states. Garfield was inducted into the Hall of Fame in 1988; he passed away in 1984 at age 76. Kaiser was inducted in 2011 and died in 1967 at age 85. Another important figure in the realm of prepaid healthcare is Dr. Paul Ellwood Jr., but more on the policy side than the delivery side. While practicing medicine for 17 years, Ellwood saw firsthand what he considered a flawed insurance system in American healthcare. And he started looking for alternatives. Ellwood is widely known as the “father of managed care” as well as a concept he helped develop dubbed managed competition. He coined the term health maintenance organizations, for the prepaid, comprehensive plans that he saw as a promising alternative to fee-for-service medicine. He also saw HMOs as a better free-market approach than government-run programs. His work with the Nixon administration led to passage of the Health Maintenance Organization Act of 1973. Ellwood developed the theory of managed competition along with colleague Alain Enthoven, an economist and Stanford professor. They were leading members of the Jackson Hole Group, a loosely organized circle of healthcare practitioners, economists, public officials and others who met regularly for decades in Ellwood's house in Jackson Hole, Wyo. The theory envisioned a government-guided system of private health plans and insurers that would compete to enroll large regional pools of workers. Vigorous competition would drive down the cost of care. A version of managed competition became a centerpiece of the Clinton administration's ill-fated healthcare reform proposal in the early 1990s. But Ellwood would back away from supporting the plan, citing too much government regulation and not enough emphasis on competition and outcomes. Ellwood was inducted into the Hall in 2000. Few people in Congress left their fingerprints on more healthcare legislative accomplishments than the late Sen. Ted Kennedy of Massachusetts, who served for 47 years. Kennedy is the only member of Congress to be inducted into the Hall of Fame. He was an original sponsor of some of the nation's most impactful healthcare laws, including the State Children's Health Insurance Program, which has provided coverage to tens of millions of uninsured young Americans since 1997. After getting caught up in a contentious budget debate earlier this year, CHIP was extended for another six years. Kennedy also pushed through the Emergency Medical Treatment and Labor Act, enacted in 1986, requiring hospital emergency rooms to treat all patients regardless of their ability to pay; and the Americans with Disabilities Act of 1990, which established broad civil rights protections against discrimination for all individuals with disabilities. While Kennedy clearly had no problem being a partisan street fighter, all of his major legislative achievements required plenty of working with colleagues across the aisle. In 2008, President George W. Bush signed the Mental Health Parity and Addiction Equity Act, enacting legislation introduced in the House by Kennedy's youngest son, Rep. Patrick Kennedy. The law requires insurers to provide coverage for mental health and substance abuse disorders equal to medical/surgical benefits, especially cost-sharing and treatment limitations. The elder Kennedy helped shepherd the law through the upper chamber. He would pass away less than a year later at the age of 77 after a battle with brain cancer. Effective advocacy is just as critical as workable policy for meeting healthcare objectives—and that's especially true in the battle to raise awareness about individual illnesses. Long before the wildly popular Ice Bucket Challenge raised the profile of the battle against ALS, or Lou Gehrig's disease, Nancy Brinker was making it her life's work to defeat the cancer that took her sister's life at a young age. Brinker's sister was Susan G. Komen, who died of breast cancer at age 36 in 1980. Brinker founded the Susan G. Komen Cancer Foundation in 1982 with only $200, a broken typewriter and a list of possible donors. Nearly 40 years later and with more than $2 billion raised through events like Race for the Cure, who doesn't link the color pink with the ongoing fight in the memory of Susan G. Komen? As a colleague once said, Brinker “literally ignited the global movement against breast cancer.” She was inducted in 2007. Heart disease remains the No. 1 cause of death in the U.S., killing more than 600,000 annually, according to the Centers for Disease Control and Prevention. But thanks to decades of advances in cardiovascular care, especially through surgical interventions, survival rates and quality of life have improved significantly for those suffering from cardiac conditions. One of the true pioneers in cardiovascular surgery was Dr. Michael DeBakey, who enjoyed a career of invention and clinical innovation that lasted seven decades, the vast majority at Houston's Baylor College of Medicine and Methodist Hospital, Baylor's main teaching facility. Over the years, his surgical breakthroughs came fast and furious, especially in the 1950s and '60s, including development of the Dacron graft to repair damaged blood vessels. He performed the first carotid endarterectomy, which involved removing a blockage in the main artery of the neck that supplies blood to the brain, advancing the treatment of stroke. In 1964, he performed the first successful coronary bypass procedure. Just two years later, he was the first to successfully use a partial artificial heart to treat a patient who could not be weaned from a heart-lung machine after open-heart surgery. He would continue to work on perfecting the artificial heart. Another equally pioneering heart surgeon, Dr. Denton Cooley, was a protege of DeBakey, who recruited him to Baylor. But the partnership wouldn't last. Cooley is credited with numerous cardiovascular inventions and groundbreaking procedures. The most famous of his feats is being the first to implant a totally artificial heart in a patient in 1969. Cooley had implanted the device without DeBakey's authorization or even his knowledge. Up to that point, the device that DeBakey and colleagues had been designing was still experimental and had only been tested in animals. Thus started a 40-year feud. Cooley had already begun to practice at nearby St. Luke's Episcopal Medical Center, where he would establish the Texas Heart Institute. He was a prolific clinician who at the peak of his career was known as the busiest heart surgeon in America, using assembly-line techniques to treat as many patients as possible. DeBakey, inducted into the Hall of Fame in 1996, died in 2008 just two months shy of his 100th birthday. Cooley, inducted into the Hall in 2013, passed away in 2016 at age 96.